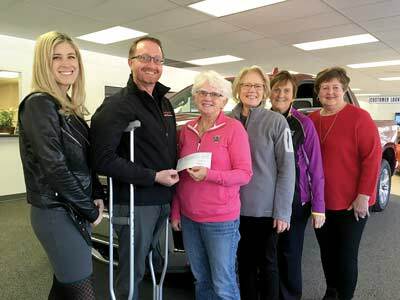 The Trout Lake Ladies golf league recently received a check of $4,200 from Marthaler Chevrolet Buick of Minocqua. This generous donation will be used to help continue funding the league's "We Care" totes which are given to any breast cancer patient in the Northwoods area receiving care at James Beck Cancer in Rhinelander and Marshfield Clinic in Minocqua. The totes are a package of personal care and comfort items that patients receive during their treatment time to help remind them that the community is with them during this difficult time. The totes are funded through "Let's Tee Off Against Breast Cancer," a ladies-only, golf scramble, June 20 at Trout Lake Golf Club. Pictured, from left to right, are Elizabeth Gering, Howard Young Foundation; Mark Biesterfield, General Manager, Marthaler Chevrolet; Karen Lewis, Chairman of "Let's Tee Off Against Breast Cancer" and committee members Terry Lonnborg, Becky Rathkamp and Judy Talbott. For more information about the event, call Mike Osborn at 715-385-2189 or Karen Lewis 715-588-1273 or visit www.troutlakegolf.com.